This form is designed for an industrial sublease between an existing tenant and a new subtenant. Both parties have considerable leverage, and the sublease has detailed provisions concerning insurance, access, parking, maintenance and repair, and use of the premises. 5. Use Of The Leased Premises. Sublessee shall use and occupy the Building for warehouse (raw materials and semi­finished goods), distribution, light manufacturing and office space in connection with Sublessee’s normal business operations and for no other use without the prior written consent of Sublessor in each instance, which consent will not be unreasonably withheld. 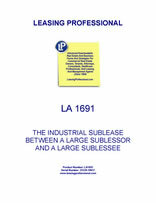 Sublessee acknowledges that Sublessee has inspected the Leased Premises and accepts the Leased Premises in their present condition (subject only to Sublessor’s obligation set forth in Paragraph 7 hereof to remove interior partitions and a masonry structure in the Building prior to the commencement of the term of this Sublease) and without any representation or warranty by Sublessor as to the condition of the Leased Premises or as to the use or occupancy which may be made thereof, and Sublessor shall not be responsible for any latent defect or change or condition in the Leased Premises, and the rent hereunder shall in no case be withheld or diminished on account of any defect in the Leased Premises, nor for any change in its condition or for any damage occurring thereto, nor because of the existence of any violation of any municipal or other governmental laws, ordinances or regulations. In addition, Sublessor or Sublessor’s agents have made no representations or promises with respect to the Leased Premises, nor are any rights, easements or licenses acquired by Sublessee by implication or otherwise, except as expressly set forth in the provisions of this Sublease. The taking possession of the Leased Premises by Sublessee shall be conclusive evidence, as against Sublessee, that Sublessee accepts the same “as is” and that the Leased Premises were in good and satisfactory condition at the time such possession was so taken. 6. Parking. Sublessee shall have the exclusive use of the Parking Area designated on Exhibit “A” attached hereto, and Sublessee shall stripe and maintain the same at Sublessee’s own cost and expense and shall be responsible at its expense to repair all areas of the Parking Area asphalt in need of repair which do not exceed 16 square feet in area; otherwise, Sublessor shall be responsible at its own cost and expense (except as hereinafter provided) to make all other repairs to the Parking Area asphalt, as well as to resurface the Parking Area and the Crossover at the same time or times as Sublessor shall resurface its parking areas adjacent to the Leased Premises. Notwithstanding the foregoing repair obligation of Sublessor, Sublessee shall be responsible at its own cost and expense to undertake and complete all repairs to the Parking Area which are required because of damage to the Parking Area caused by Sublessee, its employees, agents, invitees or licensees, and which are not a result of normal wear and tear on the Parking Area. Sublessee shall also be responsible for repairing and maintaining all lighting and illumination fixtures located in the Parking Area, and shall be responsible for the repair and maintenance of all curbs, landscaping and outdoor sprinkler systems located around the Building or in the Parking Area. Sublessee, at its sole cost and expense, shall prior to July 1, 19__, supply and install suitable barricades of a type and quality and at the locations around the perimeter of the Leased Premises and the parking lot covered by the Current Parking Lot Sublease as shall hereafter be agreed upon between Sublessee and Sublessor in a side letter agreement and which shall insure the complete separation of Sublessee’s business activities on the Leased Premises and such parking lot from those activities of Sublessor on Sublessor’s leased property located adjacent to the Leased Premises and such parking lot; provided, however, that upon execution of this Sublease by the parties hereto, Sublessee shall as a minimum place appropriate barricades around the Parking Area and such parking lot to insure that all persons or vehicles utilizing the Parking Area and such parking lot will enter and leave the Leased Premises only over the access routes provided in Paragraph 4 hereof and will not trespass on Sublessor’s leased property located adjacent to the Leased Premises and such parking lot. 7. Maintenance And Repair. Except as otherwise specifically made the obligation of Sublessor in this Sublease, and in addition to Sublessee’s duties and responsibilities for maintenance and repair as otherwise specified in this Sublease, Sublessee shall maintain and take good care of the Leased Premises and fixtures and appurtenances therein, including without limita­tion, maintenance of the hydraulic loading lifts (each of which lifts Sublessor hereby represents will be in good working order on the date the term of this Sublease shall commence or on the date Sublessee shall first utilize such lift, whichever date shall first occur) and general cleaning of the Leased Premises. In addition, Sublessee at its sole cost and expense shall make all repairs to the Building of a non-structural nature as and when such repairs are needed to preserve the Building in good working order and condition, including without limitation, repairs to the air-conditioning and heating systems, fire extinguishers and sprinkler alarm system and other mechanical and electrical apparatus. During the period of partial occupancy as described in Subparagraph 2(c) hereof, Sublessee’s obligations under this paragraph shall apply to the portions of the Leased Premises actually occupied by Sublessee. All damage (including without limitation, total or partial destruction) or injury to the Building and to its fixtures, glass, appurtenances and equipment or to the Leased Premises in general caused by Sublessee moving property in or out of the Building or on or off the Leased Premises, or by installation or removal of furniture, fixtures or other property, or resulting from fire, explosion, damage to the air-conditioning unit or system, short-circuits, flow or leakage of water, steam, eliminat­ing gas, sewerage or odors or by frost or bursting or leaking of pipes or plumbing works or gas, or from any other cause of any kind or nature whatsoever, due to carelessness, omission, neglect, improper conduct or other cause of Sublessee, its servants, employees, agents, visitors or licensees, shall be repaired, restored, replaced or reconstructed promptly by Sublessee at its sole cost and expense to the satisfaction of Sublessor. All such repairs, restorations, replacements and reconstructions shall be in quality and in class equal to the original work or installations and shall be done in a good and workmanlike manner and in accordance with current building codes; provided, however, that this paragraph shall not require Sublessee to undertake any repair, restoration, replacement or reconstruction work on the Leased Premises which a governmental agency may require in order to bring the Leased Premises up to current building code standards if such work is not in any way related to, or made necessary by, the carelessness, omission, neglect, improper conduct or other cause of Sublessee, its servants, employees, agents, invitees or licensees. Sublessee shall be entitled to utilize any insurance proceeds received by it or by Sublessor for the purpose of repair­ing, restoring, replacing or reconstructing the Leased Premises in whole or in part; provided, however, that if such insurance proceeds are not sufficient to cover the cost of such repair, restoration, replacement or reconstruction, Sublessee shall be responsible for payment of such cost in excess of the available insurance proceeds, and provided further, that any failure on the part of Sublessee to maintain adequate levels of insurance coverage shall in no way relieve Sublessee of its obligations to repair, restore, replace or reconstruct at its cost and expense under this Paragraph 7. If Sublessee fails to make such repairs, restorations, replacements or reconstructions, the same may be made by Sublessor at the expense of Sublessee (with Sublessor being able to utilize all applicable insurance proceeds for such work) and all sums so spent and expenses incurred by Sublessor in excess of insurance proceeds available to Sublessor for such repair, restoration, replacement or reconstruction shall be collectible as additional rent and shall be paid by Sublessee within ten (10) days after rendition of a bill or statement therefor. During the course of such repair, restoration, replace­ment or reconstruction, this Sublease shall continue in full force and effect without abatement, diminution or reduction of rent. Sublessor shall, at its expense, make all repairs and replacements, structural or otherwise, necessary or desirable in order to keep in good order and repair the exterior roof and structural integrity of the Building; provided, however, Sublessor shall have no responsibility for repair or replacement of any part of the exterior roof or structure of the Building which has been constructed and/or installed by Sublessee. Sublessor shall also be responsible for painting the exterior of the Building and for replacing the air-conditioning and heating systems located within the Building when such replacement shall be required due to ordinary wear and tear. In addition, Sublessor shall be responsible for removing prior to the commencement of the term of this Sublease all interior partitions, as well as the elevated masonry receiving and observation platform located near the receiving docks inside the Building. Except as otherwise specifically made the responsibility of Sublessor in Paragraph 6 and Paragraph 7 hereof, Sublessor shall have no responsibility to maintain or repair, or make any replacements on the Leased Premises.